My faithful photographer was off training Carlin this morning, so the photos I have are sans dog. But these photos are two views of the Open-level Barn Hunt course that Tooey and I practiced on today. The hardest part of today’s course was, as always, the tunnel. For the Open level, the tunnel is 4 hay bale widths long, and in the middle, it takes a right-angle turn. So going in, the dog sees no light at the end of said tunnel. Plus, the tunnels are only 1 hay bale width high, shorter than Tooey is tall. Tooey had two runs. In both, she found her two rats with no trouble, and didn’t hesitate to jump up on the bales to see if the rats were hidden up there. This is good. At last practice, she searched the ground, but didn’t seem to think that there would be any elevated rats. This time, she remembered that rats could be up off the ground. But taking the tunnel is still not a sure thing. On her first run, she squeezed herself through so nicely that I thought she’d gotten the concept. On the second run, though, she’d stick her head in the entrance, but didn’t proceed. So, the woman playing judge planted a tube with a rat in it right at the end of the tunnel. And when Tooey was in half way, I hurried to the other end with liver treats to reward her with. Plus praise. Lots and lots of praise. So I call this a great practice. She’s not ready to compete yet, but we’re getting there. Ms Tooey is good bird dog, but she has always been a good critter dog, too. Critters are anything that loosely fall into the rodent category, ranging from field mice to porcupines. It doesn’t matter if they live in trees or underground; all are fair game for her. Patrice has even put a Barn Hunt title on this girl because of her distinct talent for ferreting out rodents (appropriate verb even if she isn’t a weasel). Currently, our new home in Boise has enough tree squirrels to keep both Tooey and Carlin busy and vigilant. They spend several hours everyday laying in wait underneath a lilac bush as a brace of squirrel predators. This lilac bush is strategically placed next to one our neighbor’s sheep pens where corn and other feed is bait for squirrels. From their hideout, the pups can scan the fence line and trees for any incoming marauders. So it was a bit unusual when Tooey started sniffing the dirt at the back fence last night. She would not leave one specific area and then started digging at the base of the fence. She even got Carlin interested, and the two of them alternated pounding on the fence with digging at the base. She was so persistent that we had to drag her inside last night, as she would not leave the fence line or respond to a verbal recall. We were puzzled because on the back side of the fence is a neighbors’ decorative fountain, with no indication of rodents, just the sound of trickling water. This morning she made a bee-line to the spot and started digging again. As soon as the critter was disposed of, and Tooey confirmed that there was nothing of interest behind the fence, she returned to her post under the lilac. Barn Huntress Most Excellent . . .
Tooey got her RATN title from the Barn Hunt Association last month. Fortunately, the AKC and Barn Hunt have an agreement whereby the AKC will recognize Barn Hunt titles as part of their Barn Hunt Titles Recognition Program. 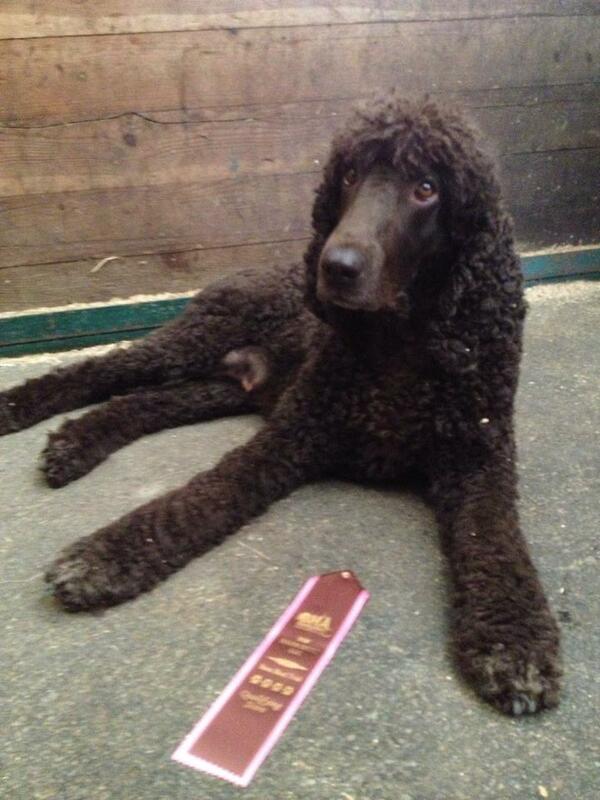 So, now the AKC shows that she has a nice shiny new AKC-recognized title to add to her long list. As I’m looking at this, I marvel at all the activities Tooey, Russ, and I have participated in together. And I notice that they’re all “novice”-type titles. I’m going to have to look at that, and see when next we can train for the next level of Barn Hunt, Tooey’s current fav. As I was driving home from the NW Barn Dogs barn hunt trial today, it hit me. Barn hunt is the only dog sport in which Tooey pays no attention whatever to all the people in and outside of the testing area. In Obedience and Rally, she was always a bit wary of that person who kept following us everywhere (aka, the Judge). In one Obedience trial, for example, she sort of did the heeling pattern, but she did it such that I was always between her and the judge. That meant that sometimes Tooey was on my left, as required, but sometimes she was on my right or behind me. In retriever hunt tests, she would mark the fall of the bird just fine, but once she got out there in the field to retrieve it, she would eye the gunners and bird boys, hiding nearby in blinds, with a great deal of suspicion. At one test, she found the bird, but then, catching sight of the bird boy, she sat and looked back at Russ. You could see the thought bubble over her head: ‘Who are these guys, and what the heck are they doing out here?” Similarly, in many spaniel tests, she would make a point of staying away from the gunners, who walk either side of the course with the dog and handler, or she would study them carefully before going off looking for birds. I think, maybe, Barn Hunt must be Tooey’s sport. We qualified in two Novice barn hunt trials today, earning Tooey her RATN title. But even better than the title was her performance. The first trial she needed only about 1 minute 7 seconds. She found her her rat (which was held out of harm’s reach in an aerated tube) almost right away, pawing and digging at it — no way could I miss that find. I called “Rat!”, and then all I had to do was get Tooey to pass through the required tunnel and climb up on a bale. She didn’t really want to do either; she was intent on hunting for more rats. But finally, after my third request, she hopped up onto a bale and ran through the tunnel, almost all in one move. The whole time, I don’t think she even noticed the judge or the rat wrangler. This was her third pass, that that earned us her title. Today’s second trial (her fourth “bonus” pass) took her only just over 39 seconds. She knew her job, and executed all three required elements, pretty much in the same order as the first time: rat, bale, tunnel. 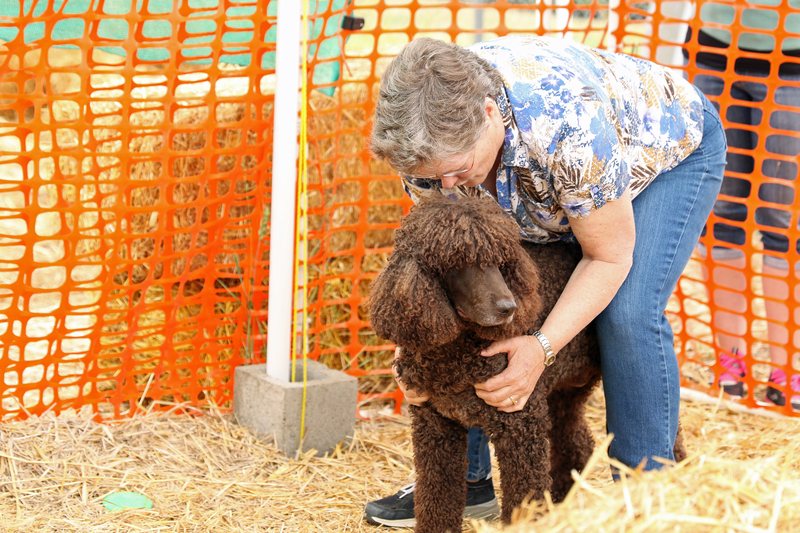 It was a fun day, and I am so proud of my Irish Water Spaniel girl, who in her past life, must have been some kind of earthdog. I blame the heavy rains. Or maybe it’s Santa Claus’s fault. She’s been busy down in the basement, following her nose and her ears, tracing the path of said mouse along the baseboards, up the insides of the walls, and behind the furnace and washing machine. Last night, I came in the back door (which shares a hallway with the stairs down into the basement), to find a dead mouse. I assume it was thoughtfully delivered there as a memento, a prize, a trophy for me to find when I came back from my errands outside. Unfortunately, I did not appreciate it in quite the style a hard-working Irish Rodent Spaniel might wish. No, instead of saying “thank you,” I just screamed. But I should have thanked Tooey better than that. After all, I have previously praised her for her rat hunting prowess at Barn Hunts. The least I could do is tell her what a good little hunter she is. So: Good hunting, Tooey. Good girl. If you catch any more, give them to Russ. He’ll be delighted, I’m sure. I knew it was going to be really hot in Salem, and I hoped Tooey would be hot on the trail of a rat there, too. And in fact, she found three (one with a little help)! 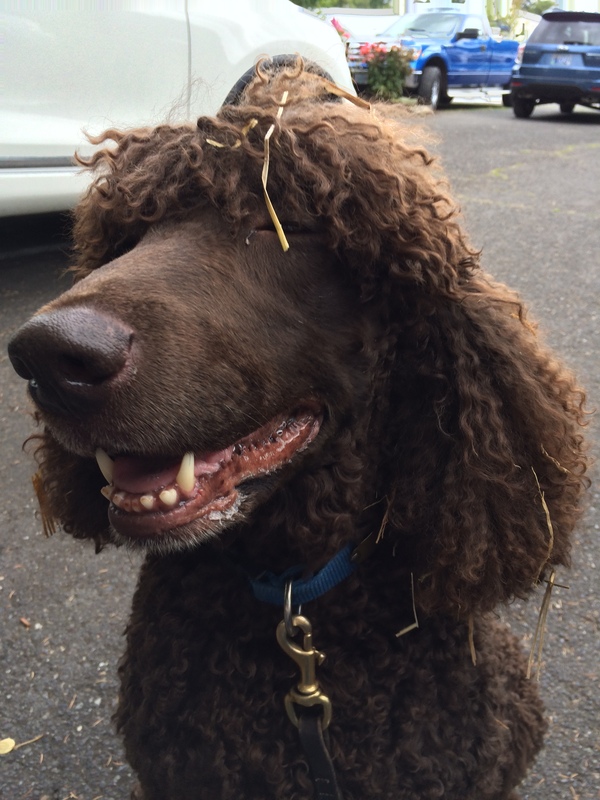 We found the Northwest Barn Dog’s Barn Hunt at the Oregon State Fairgrounds in the Livestock Pavilion. Just like the last (and also our first) Barn Hunt we attended, there were lots of terriers and “go-to-ground” dogs, but there were also a fair spread of other breeds, everything from a Cavalier King Charles Spaniel, to a Poodle and Portuguese Water Dog, to an Afghan hound. 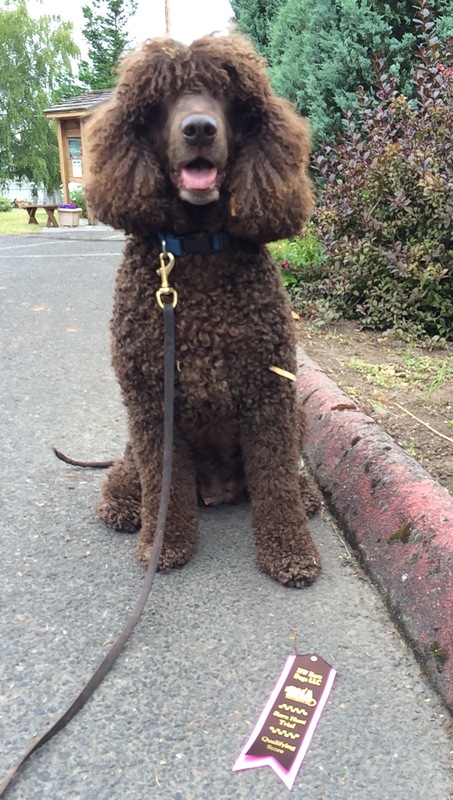 Tooey was the only Irish Water Spaniel. The judge gave me a funny look, and then I remembered the rule: the handler must call out definitively, “Rat!” So, I said, “um…, Rat.” The judge’s expression changed, he said “Congratulations,” and with that Tooey earned her RATI title. In the Instinct test, Tooey had found the rat in much less than her allotted minute, but she didn’t seem all that interested in it, so when it came time to enter the first Novice trial of the day, I wasn’t sure what kind of signs to look for. How was she going to show/tell me where the rat was hidden? Since the rat tubes are moved every five dogs, and since dogs and handlers have to stay behind a blind while each member of their group of five is in the ring, I wouldn’t know where the rat was hidden. Tooey would have to find it, and tell me she’d found it. 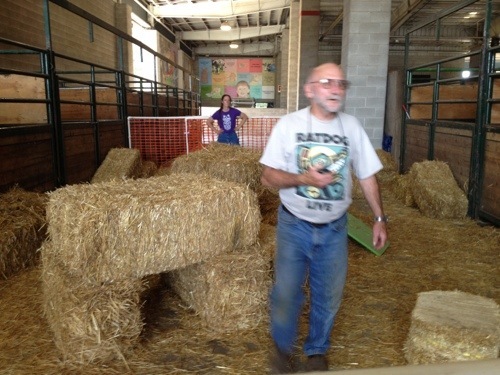 The Novice course is more complicated than the Instinct test, and the tubes are hidden under hay, in and around hay bales, rather than being out in plain site. While waiting for our turn, I had helped as leash runner and scribe at the Novice ring, so I’d been able to watch about 15 Novice dogs hunt in the hay ahead of us. Some madly wagged their tail when they found the rat, others barked, some tried to dig the tube out from under the hay, some looked back and forth between the rat and their handler. And some seemed to give no sign at all. That’s what I was afraid Tooey might do, based on her performance in Instinct. So when we got into the ring, I made several errors. I didn’t give her long enough to hunt, and I didn’t direct her quickly enough to new areas of the ring to hunt, and then I called “Rat” at the first spot she’d shown some interest in. Turned out, that had been a spot where a rat had been hidden at one time. Once nice thing about Barn Hunt is that when dogs fail to qualify because they didn’t find the rat, the rules require the judge to take the handler to where the rat is hidden, so that the handler can direct the dog to the rat and then praise the dog for having found it. I took full advantage of that, praising Tooey generously for having found the rat, and then as soon as we were out of the ring, rewarding her with many salmon treats. After getting ourselves soaked with water from a garden sprayer and then resting quietly in the shade, we had a second try in the afternoon. This time, Tooey found the rat quickly and decisively. She dove nose first into the pile of hay, and then tried to push the tube out into the open. With that, she completed the Rat element of the trial, but to qualify in the trial, she also had to jump up with four feet onto a bale (the Climb) and go through a tunnel made of hay (the Tunnel). Getting her up onto the hay bale didn’t take too much longer — I just encouraged her to search up on the top of three stacked bales, and she had to climb up to do that. But then it took her forever (I have no idea how long, as handlers are not allowed to time themselves) to go through the tunnel. I’ll find out in a couple of days, but I’ll bet her time was very close to the 2 minutes allowed to complete all three elements. But in any case, she qualified, and earned her 2nd (of 3 required for the RATN title) Barn Hunt Novice leg, and I learned what she does when she finds the rats — dives in nose first.